Learn how to use Service Broker to send messages between databases in a single instance or between multiple instances. This course is applicable to all versions of SQL server and is aimed at application and database developers. The Service Broker feature of SQL Server is transforming the way developers think about processing requests within the database and open new opportunities for scalable applications. 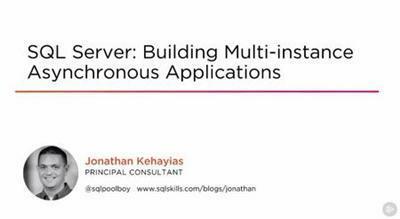 This course builds on the basic concepts introduced in the SQL Server: Building Simple Asynchronous Applications course by introducing single-instance multi-database and multi-instance configurations for Service Broker. In this course, SQL Server: Building Multi-instance Asynchronous Applications, you'll learn how to configure security for Service Broker operations across databases as well as the networking and routing configurations for secure communications between multiple instances of SQL Server. Next, you'll explore bidirectional conversations between services to allow for status updates and the appropriate way of ending a conversation between two services. Finally, you'll see how to maintain and troubleshoot Service Broker configurations using the SSBDiagnose tool to validate that all of the required components have been appropriately configured, using the Dynamic Management Views for checking message statuses, and using the events in SQL Trace and Extended Events for troubleshooting Service Broker problems. When you've finished this course, you'll have the skills and knowledge to start implementing multi-database and multi-instance Service Broker configurations.